Set custom budgets that alert you when you exceed your budgeted thresholds. Budgets can be tracked at the monthly, quarterly, or yearly level, and you can customize the start and end dates. You can further refine your budget to track costs associated with multiple dimensions, such as AWS service, linked account, tag, and others. 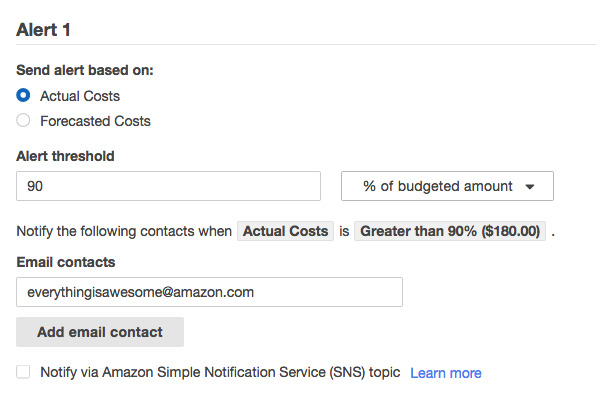 Budget alerts can be sent via email and/or Amazon Simple Notification Service (SNS) topic. Budgets can be created and tracked from the AWS Budgets dashboard or via the Budgets API. The AWS Budgets Dashboard is your hub for creating, tracking, and inspecting your budgets. 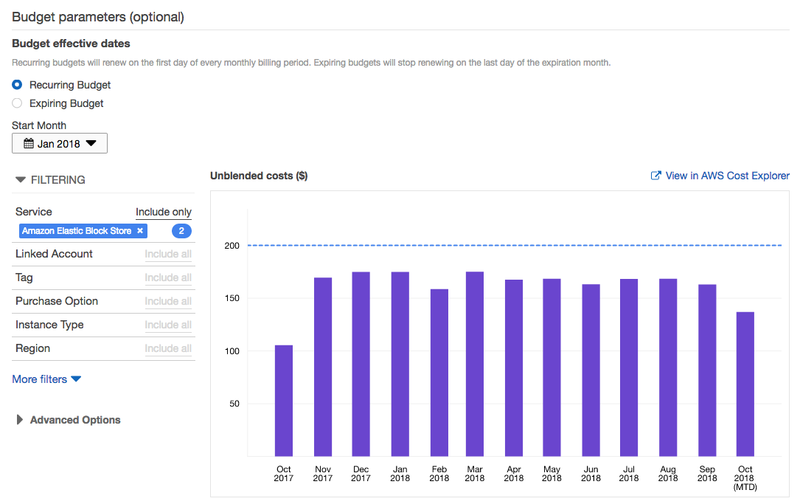 From the AWS Budgets Dashboard, you can create, edit, and manage your budgets, as well as view the status of each of your budgets. You can also view additional details about your budgets, such as a high-level variance analysis and a budget criteria summary. To create a total monthly cost budget, specify "cost" as the budget type, "monthly" as the budget period, and a custom amount to budget against. From there, you don't need to adjust any of the filters, since a total monthly cost budget will cover all of your costs. It is advisable to add one or more notifications to each budget. For example, you can set notifications that alert you if you accrue 80%, 90%, and 100% of your actual budgeted costs, as well as a notification that alerts you if you are forecasted to exceed your budget. Please note that you can set up to 5 notifications for each budget. Each notification can be sent to 10 email subscribers and/or published to an Amazon Simple Notification Service (SNS) topic.